The St. James Hotel was constructed as a 12-story brick and stone hotel in 1900. The owner was Central Realty Co., 320 Broadway, and the architect was Harry B. Mulliken, 289 4th Ave. (Office for Metropolitan History). This account from the New York Times, 4 March 1903, pg. 14, describes its early history: "Edward H. Litchfield has bought from Charles H. Dederer the Hotel St. James, a twelve-story structure at 107 to 113 West Forty-fifth Street, on plot 60 by 100.5. Mr. Litchfield gives in part payment forty-three lots on Eighth Avenue, Fourth and Fifth Streets, in the Park Slope section of Brooklyn. The St. James was built for Mr. Dederer by the Central Realty Company, and was completed a little over a year ago." Edward Hubbard Litchfield (1845-1930) was not by trade a hotel man, but a real estate dealer, and it is likely that while he owned the hotel, management was handled by others. The 1910 U. S. Census shows William Wyckoff, age 37, born Pennsylvania, as manager at the St. James Hotel. An additional 91 others were listed as either servants or lodgers living at 109 W. 45th St. The St. James did, however, become the property of a man who was decidedly a "hotel man" in the early 1920s. This was William Johnson Quinn (1861-1944). W. Johnson Quinn, as he was usually known, was born in Canada in 1861 and came to the U. S. as a child. This ad from 1920 identifies Quinn as manager at the St. James. This one from 1921 identifies him as "President." This one from 1922 identifies him as "Proprietor (formerly of Hotel Webster)." The 1930 U. S. Census listed 37 residents at the St. James Hotel, 109 W. 45th St., including William J. Quinn, age 68, born Canada, as the hotel manager. On his death in 1944 the following appeared in the New York Times, 27 Feb. 1944, pg. 37, "W. Johnson Quinn, former owner and manager of the Hotel St. James, 109 West Forty-fifth Street, died in his home there on Friday after a long illness. His age was 83. Mr. Quinn, who had been a leader of the Hotel Association of New York, had spent years of research and many thousands of dollars tracing the histories of the famous hostelries of this city from the Dutch inns to the present hotels. Born in Durham, Canada, he entered the hotel business on Oct. 2, 1876, as a bell boy at the Hotel Brunswick here and remained in the hotel business until his retirement six years ago. Mr. Quinn had owned and operated the Allenhurst (N. J.) Inn and managed the Hotel Empire and Hotel Webster. He leaves a widow, Mrs. Nellie Hamilton Quinn." Early hotel ads trace Quinn's hotel career from The Arverne on Long Island in 1894, The Empire at Broadway & 63rd St. in 1895, The Allenhurst Inn in Allenhurst, N. J. in 1901, and The Webster at 40 W. 45th St. in 1917. The Litchfields that owned the St. James Hotel from 1903 until the early 1920s were a family of lawyers and real estate dealers. Edward Hubbard Litchfield, who bought the St. James in 1903, was followed into the real estate field by two sons, Edward Hubert Litchfield (1875-1949) and Bayard Sands Litchfield (1880-1960). Bayard S. Litchfield's son, Edward Sands Litchfield (1911-1984), formed a third generation in the succession. For many years the family business was known as the Brooklyn Improvement Co., located at 360 Third Avenue, Brooklyn. 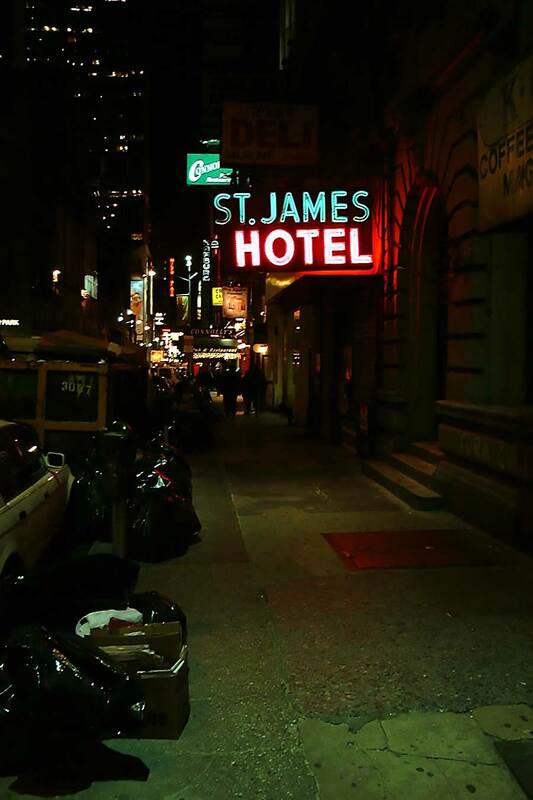 As of January 2016 the St. James Hotel continued in business on West 45th St. Their website, www.hotelstjames.net includes, "Since 1972, Hotel St. James has remained a classic staple of New York City's Times Square. Housed in a beautiful, twelve story, pre-war tower Hotel St. James offers what other hotels in the area cant; Space and Comfort at affordable rates." This obituary for Bernard Saltzman in the New York Times, 18 Oct. 1972, pg. 50, indicates that he operated the St. James Hotel until the time of his death: "Bernard Saltzman, owner of the Diplomat Hotel and operator of other hotels here and upstate, died of a heart attack last evening at his ofice in the Diplomat, 108 West 43d Street. He was 56 years old and lived at 50 Black Heath Road, Lido Beach, L. I. Mr. Saltzman also operated the St. James Hotel on West 45th Street, the Central Apartments Hotel at Broadway and 88th Street, and the Spring Lake Spa in Parksville, N. Y. ..."
Ownership and management at the hotel probably changed in 1972, since their website seems to date their origin to this date. A view of the St. James sign in the daylight in 2002.